As I meandered through Colorado on my cross country RV trip I found myself in the town of Marble at the Slow Groovin BBQ Bar and Grill. I think it fair to say that with a population of 131, according to the 2010 census, Marble is a tiny town. It’s fairly well lost in the mountains, in a canyon off another canyon, down a secondary highway, Colorado 133. Marble got its name by virtue of the fact that there is marble quarry there, which, incidentally, I’ve heard, has been closed and opened, closed and opened, over the years, ownership changing hands a number of times. The quarry is now owned by Colorado Stone Quarries, which I’m told is a Canadian concern despite the fact that the owner is Italian and marble from the quarry being shipped to Italy which strikes me as a bit of a twist. Why does somebody live in such a remote place? What’s the attraction? Pulling up a stool at the bar I struck up a conversation with the gent sitting next to me. He claimed it was his birthday, his 68th birthday. I thought maybe he was working me in hopes that I’d buy him a drink. I asked his name and he said “Gregory, Greg Tonozzi”. Tonozzi showed a sense of humor which was dry and wry, and if you weren’t on your toes you might take him seriously when he was anything but. I liked this man. I liked him from the start. When he told me he was a sculptor that lived in town I saw immediately why he chose to live in Marble. It was the marble so readily available there. I asked if I could interview him for a possible article on my blog. He consented and we made plans to meet at his place the following day. I arrived at Tonozzi’s at the appointed time after a short drive from my campsite at McClure Campground. 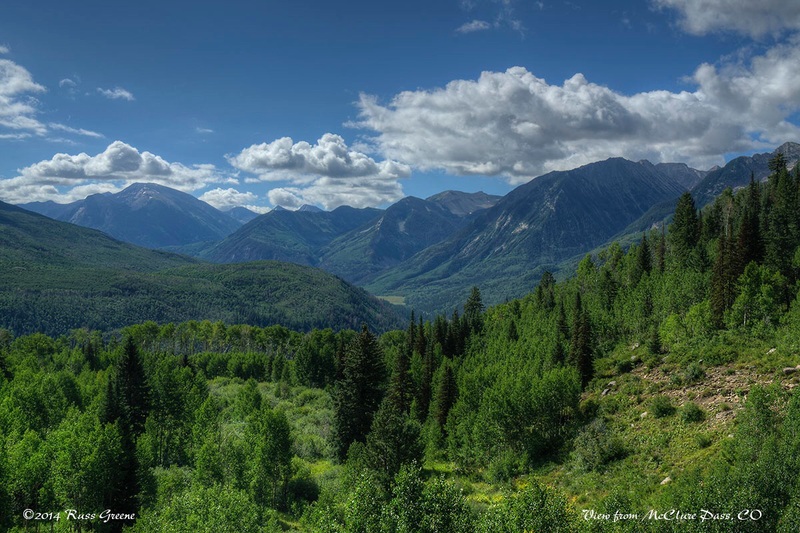 This drive winds down highway 133 through the mountains offering fabulous views of the surrounding scenery which is quite spectacular, then up along Crystal River past some houses situated in idillic settings amidst trees beside the winding river. The countryside here is beautiful–another reason to live here. This work by Tonozzi is not of marble, but I very much liked its coloring. I don’t remember what was carved from but I do recall the sculptor telling me its dust was toxic to breathe. I met the sculptor in his yard which is also his workshop. (On at least one occasion he’s referred to himself as a carver. I’m not sure of the difference between carver and sculptor, if one even exists.) The place was littered with works of art–his sculptures, some unfinished, and blocks of marble, some weighing many tons. Also scattered about were chisels, files, power tools–the tools of the artist–and chips and shards of white and green marble which had been cut and carved away from pieces of his creation. Tonozzi’s truck, April, also sat in the yard. Capable of hoisting 20,000 pounds with her built in crane, this was insufficient for bringing in the piece of marble for a sculpture he’s working on which weighed some 20 tons, about 40,000 pounds. When I asked how much a block of marble like that costs he said it’s about $1 a pound in today’s market. When we started to chat the first thing Greg pointed out were some black streaks running down the back of a male figure which is part of this piece he’s working on, Pioneer Spirits, which when finished will be installed at Pioneer Park in nearby Aspen. He said that the black streaks came from some charcoal he’d left on the figure’s head which had gotten wet in a recent rain and run down the figure’s back. “Why was the charcoal up there?” I had to ask. He explained he uses it to mark the marble where he wants to to some shaping. “Duh”, I said to myself. Tonozzi estimated that the weight of the sculpture was now about 7,000-8,000 pounds, down from the 40,000 pounds the block of marble weighed when it first arrived. He’s been working on this piece for more than four years, but not exclusively. He has more than one project going at a time. Tonozzi referred to this work as potato chips. I’m uncertain if he was kidding or not. Sometimes with him it’s hard to tell. 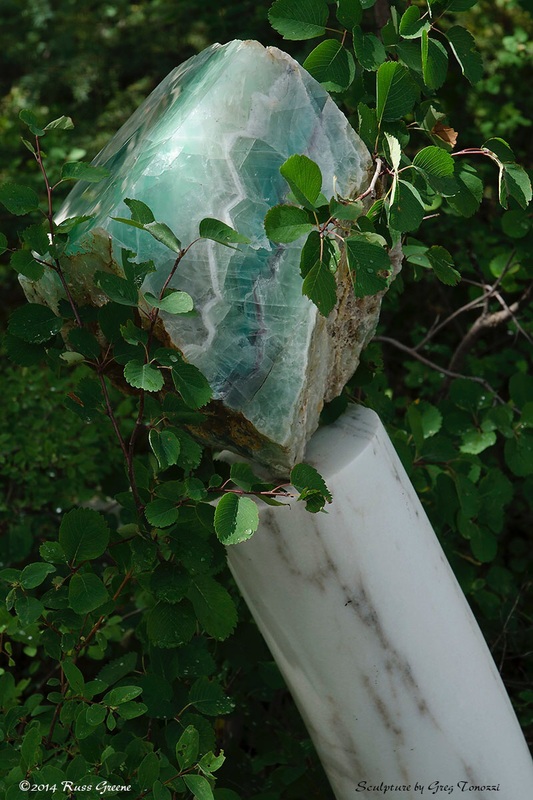 Next Tonozzi talked about a patina he liked that some of the marble in his yard was taking on. He explained that it was caused by a bacteria that grows on calcium carbonate which is what marble is. When the stone is left under trees the bacteria have a good food supply and can develop, but if the marble is placed out in the sun it will kill the bacteria and bleach the marble making it white again, that is if it was white to begin with. 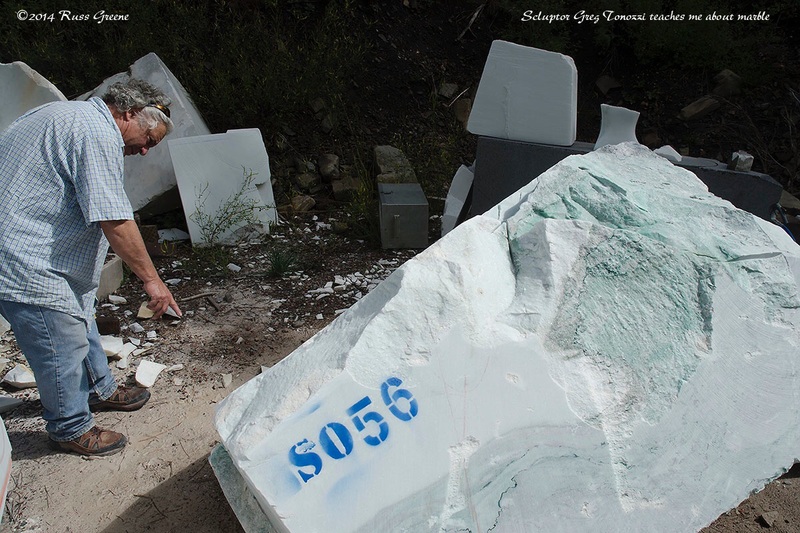 Here I should mention that the marble in Tonozzi’s yard was mostly white, some a little bit green, and this is the stuff that comes from the marble quarry in Marble. I learned that this marble was most likely a coral reef many millions of years ago and that a vein of it runs maybe 60 miles through the mountains from Marble over to Leadville, CO. Greg showed me different pieces of marble and how some were harder than other pieces that he could crumble using just his fingers. As we chatted and he told me more and more about the stuff, his in-depth knowledge about marble became apparent. 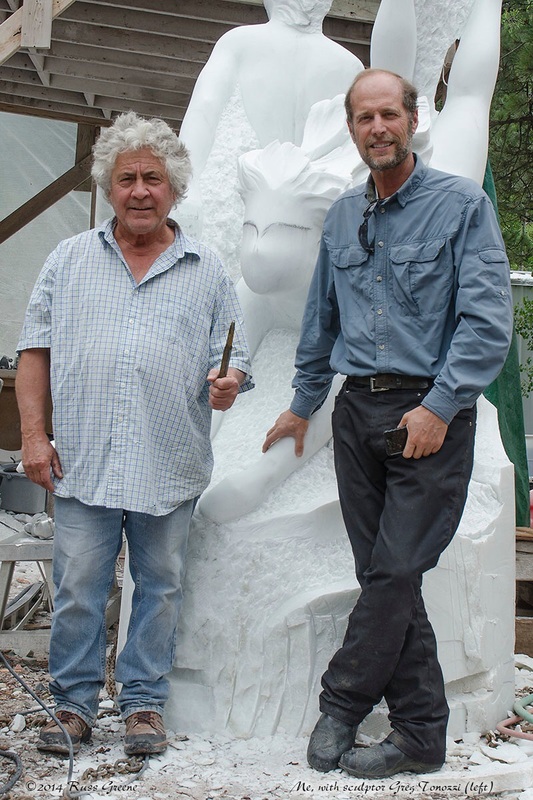 Greg has been coming to the town of Marble to get marble for some 40 years, since he first discovered his talent for sculpting, finally settling there about 2008 although he’s owned the property considerably longer. He raised his daughters in nearby Glenwood Springs and New Castle, and is excited about becoming a grandfather this coming November. The Crystal river bisects his property and he jokes about playing banjo for and shooting at kayakers as they paddle by, making reference to the movie Deliverance. The joke makes sense when you’re in Marble because it has that air of remoteness in which deliverance was set. 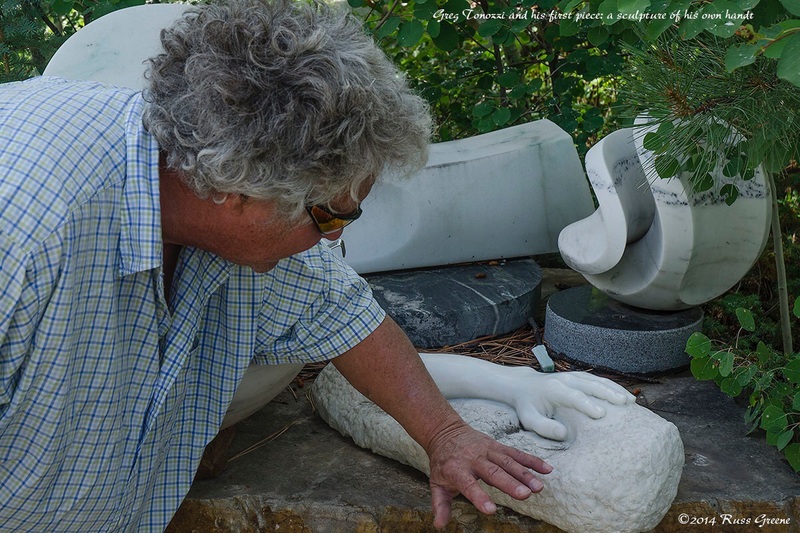 Greg excelled at math and geometry in school and has tried to inspire his sculpting students to do well in those subjects because they apply very much to the sculpting work that he does now. 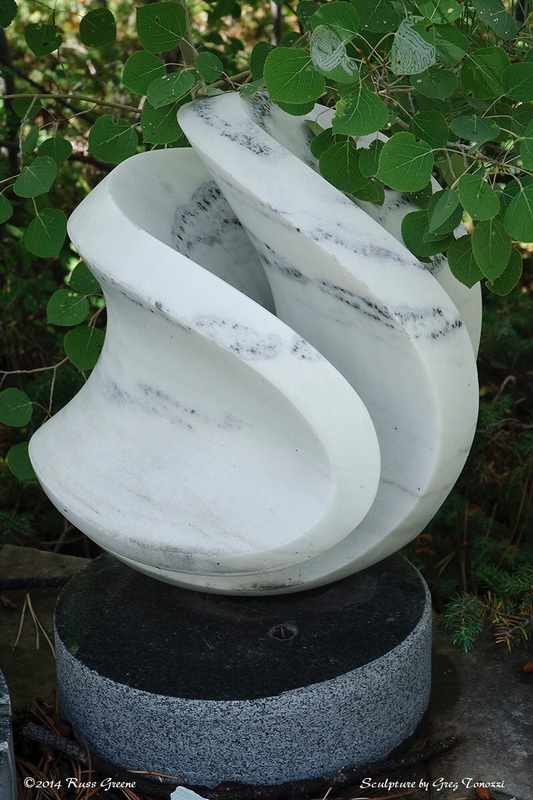 Mechanically inclined as a younger man Tonozzi saw himself as a mechanic or engineer until he found a piece of marble which he began to carve. As the form began to “pop out” of the rock his dreams changed pretty much on the spot. It was an “ah hah” moment. He knew that sculpting was what he wanted to do, was going to do, what he had to do. Yours trucly with the sculptor in front of Pioneer Spirits, a wok in progress. I never bought Tonazzi that drink, by the way. Not because I didn’t offer to, but because he wasn’t sure if he should have another. It appears he wasn’t working me after all. Tonozzi’s web site can be found here. You should hope to meet Greg Tonozzi at the bar and be lucky enough to sit and enjoy his conversation for awhile. A genuine gem in an amazing setting! Greg was fun indeed. Marble and the surrounding area were also very special. Add to that the free Forest Service campground nearby, McClure. Very interesting your interview with Greg Tonozzi-He’s quite handsome not just for 68 yrs old but also “molto simpatico”. Interesting facts about marble that I learned from you. Glad you included him in your blog. He’s the michelangelo from Colorado! Carver and sculptor are the same, but when I think about it I feel that carvers carve wood or stone, but not necessarily in the round – bas relief – is often carved. 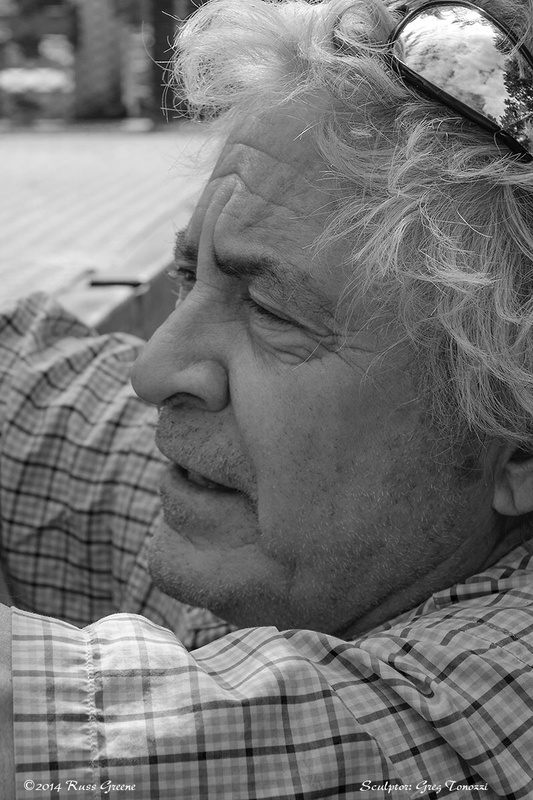 When I think of a sculpture it is often – in the round – that means you can walk around it because it is completely in 3 D. Did Greg offer any explanation about how he sees the difference between carver and sculptor? He sounds and looks italian. I like the way he allowed his first sculpture to change his life course and follow his inspiration! It reminds me of enjoying watching children play (in your last post). I love the way children (and maybe artists too) allow themselves to be seized by the moment and go with the flow and celebrate in the joy of the moment- following their inspiration and joyful play! Love the pic of yours truly with Greg- you’ve lost weight! Maybe it’s the contrast between you and Greg- but most likely the traveling diet. Thanks for this interesting blog/interview. Ciau! No, Greg didn’t explain any difference between carver and sculptor when I was with him. Maybe he mentions something about that on his web site.